Pulling together an effective business case for a CRM solution can be an onerous and daunting task. What do you include in the case, how do you get buy-in from senior management? How do you get the teams involved to be engaged and be advocates? This blog post recommends where to start when putting pen to paper to commence your CRM business case. It gives clear steps to follow, and at the end of the blog you are invited to download our free ebook – How to Get Buy-in When Building a CRM Business Case : A guide to enable effective CRM, with key tips to build a strong business case and compelling CRM strategy. Effective Customer Relationship Management (CRM) offers optimised business practise and higher customer satisfaction. Although CRM is a technology, it is very human centred focusing on relationships and experience. The experience of CRM users and customer experience. Mapping your customer journey to the technology is where CRM software starts to show exciting results, and delivers your overall CRM strategy. CRM solutions provide a great platform to strive for growth and competitive advantage. If you don’t take advantage of how technology can help you grow, rest assured your competitors will. How will CRM support the business? How will CRM support your teams? What’s in it for the leadership team? Ensure that you have key data metrics in your business case to show CRM’s return on investment. This can often be difficult to obtain as often there is no base-line data to start from. So do look around your business to find out what you are measuring and how those measurements are being achieved. Are there any metrics that link directly to your 5 key objectives? Get a key sponsor at board level. Ensure they are backing your CRM initiative and are clear on the 5 objectives. Do get your teams involved, even at business case time. Get together a project team. They will be critical to finding the most compelling 5 business objectives that CRM can achieve for you. What matters to them, how will they become CRM champions to ensure the strategy and software will produce the results you set out to achieve. It will be really important to have the business behind you at all levels – they will all want CRM and the benefits it gives. Think about who will be involved in a phase one of a CRM implementation. Breaking down the CRM project into departments or teams can reduce your risk and stabilise areas before moving to the next function. Look at your processes. Are your processes in place and ready to be optimised using Microsoft Dynamics CRM? We often recommend to look at your best sales person, and your sales person that isn’t performing as well, and look at their processes. What makes one more successful, and where do you want to focus all the sales team’s efforts so they are all as profitable. Project management time from your business. A CRM project will take up time from your people as well as your CRM supplier, it will require your focus and effort. 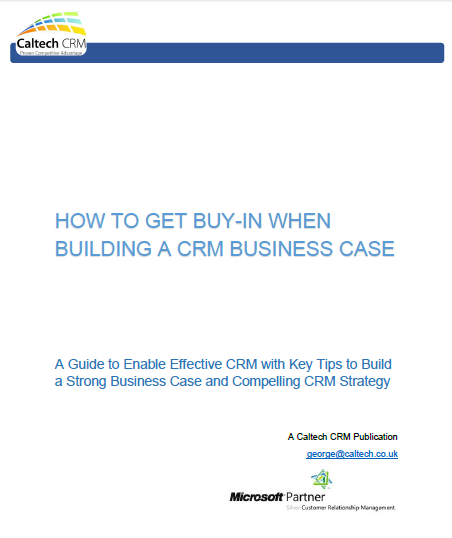 Caltech IT (Caltech CRM) has produced a new ebook : How to Get Buy-in When Building a CRM Business Case : A Guide to Enable Effective CRM with Key Tips to Build a Strong Business Case and Compelling CRM Strategy. As Silver Microsoft Dynamics CRM partners, Caltech CRM is well placed to offer such expert advice. To download our new ebook click here and download today! This entry was posted in CRM Strategy, Ebooks, Implementing CRM by Catherine. Bookmark the permalink.